Follow EFL live text here. OK, that's all from us for today. Over to you Manchester City and Leicester - you can follow that over here. Stoke City goalkeeper Jack Butland: "I thought the way we played, and the effort we put in and the intensity we created was first class. It feels like a loss at the moment, but since the manager came in our performances have improved a lot and we've picked up some decent form, there's definitely some positives to take. "We didn't deserve to be a goal down in the game, they scored against the run of play, so now we just have to keep going and look ahead to Leicester in a couple of week's time." On the incident before the penalty was taken: "Charlie Adam's taken penalties for us this season, so I've got no problem with him taking it." Stoke City defender Ryan Shawcross on the incident before the penalty was taken: "We've seen it in the past when there's a couple of lads who want to take the penalty. It's difficult when you've got subs that come on, but it won't happen again, the gaffer's told us that. "It's an emotional game, so it's difficult for [Jese], he obviously wants to take it, but as I say it won't happen again." More from Paul Lambert on the incident between Jese and Charlie Adam: "Nobody likes to see that. But Charlie Adam scored the last one against Coventry, so he was confident, and I'm a big believer in players that have got confidence taking penalties." Brighton defender Lewis Dunk: "First half we were very good, we deserved to go in with the lead at half time. But they changed things and that made it difficult for us, obviously it was a crazy end with Mat Ryan making a great save and me making a block. "I don't know how I got there to be honest, and I thought the ref was going to give another penalty. I thought that tackle was more of a penalty than the penalty that was given." On the penalty decision: "Never a penalty in a million years, it was very soft, the ball was nowhere near him." Stoke City manager Paul Lambert speaking to MOTD: "It's really disappointing not to come away with the win. In the second half we were excellent, and after getting the penalty, it's especially tough to take. "I changed the system at half time and it helped us out, it looked like we were a different side in that second half. Brighton are a difficult team to play against but it's still a good point for us." On the penalty decision: "I thought there were one or two chances for a penalty before the one we got, but I'll have to watch it back." On the altercation before the penalty was taken: "Charlie Adam always feels confident with taking them, but the good thing is that everyone wants to take them, everyone wants the responsibility. It would be more of a problem if people were shying away from taking them." Wayne Rooney was great in that holding midfield role today. He’s really bought into that position and making it his own. That said, Crystal Palace were woeful in trying to close him down. 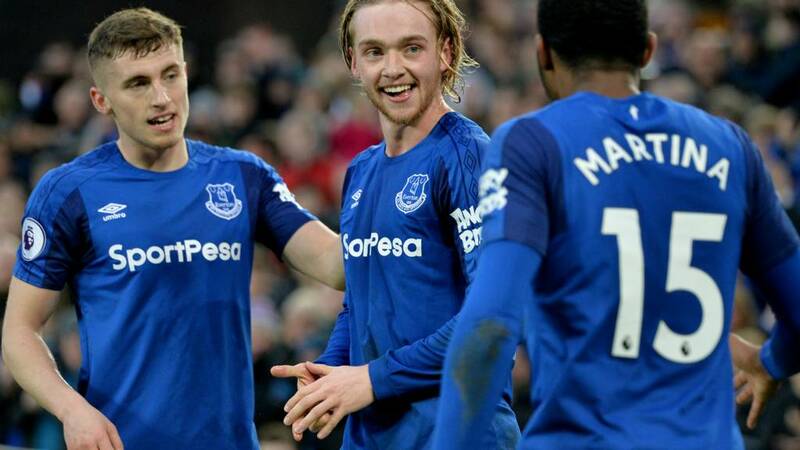 Everton manager Sam Allardyce tells Match of the Day: "We have to look at our own record and that is where the mainstay of our season lies. In the eight home games I have been here, we have picked up 17 points and conceded just four goals, we are getting it right, entertaining the fans and getting the result. The unfortunate away form is causing us the problems. "Goodison Park has always been a strong place to play, the supporters get behind you. Away from home it has been a longstanding problem. It is something we have to try and turn around. Now we can relax and enjoy the result. We got 3-0 up and the pressure was off. Even when they scored their penalty, we were not under too much pressure. We will do some sunshine training now because we are not in the FA Cup. "The Everton fans will wake up and be happy to see where we are, only two points off seventh. We are nearly safe and can get the planning done for next season, we can start penciling some things in. "I was apprehensive today after being done 5-1 away from home but the players have responded magnificently. We have shown what we can do and hopefully we can improve for the rest of the season. Our next way game is Watford so we will be looking to get something from there." Can we all agree Carvalhal is already one of the greatest managers to interview in the history of the Premier League? Watford boss Javi Gracia to BBC MOTD: "It wasn’t our best performance. We were very soft in the first half and didn’t create many clear chances during the game. We tried to change the shape and look to score a goal but West Ham dominated the areas and were more aggressive and consistent. That was the difference today. "We had more possession but that’s not the same as dominating or controlling the game. We tried but today it wasn’t our best match." "The problem today wasn’t a striker who will score. We have Troy Deeney, we have other players. Today we didn’t create clear chances." Watford's next game is in two weeks because of the FA Cup. "I’m focussed on the next couple of weeks. We have time to rest and work. We can recover injured players and focus only on the next match. That’s the best way to improve and get good results." West Ham boss David Moyes to BBC MOTD: "I thought we started really well. We were very wary of Watford after their performance and result against Chelsea. That was a concern. But we nullified them. We have threats in attacking areas - Javier Hernandez, Michail Antonio and Marko Arnautovic - which ultimately hurt them in the end." "We needed them back. All teams need their best players. "I wasn’t so happy with our second half. We didn't win much and I thought Watford were first to most things. But we defended well enough. We still merited it, we stuck at it and got the job done. "There's not that big a points difference between 11th, 10th and ninth. When I took over we were in the relegation zone, I’d have said 'you're kidding' if you said we could get into the top 10 when I took over. It’s great credit to the players. We want to keep improving." You can follow that one over here. Burnley manager Sean Dyche, speaking to BBC Sport: "It was a tight game, there was nothing in it really, there was action in both boxes but we were not nearly as good as we have been of late. We were a bit huff and puff today, and it feels like the injuries are beginning to take their toll. "Their goal was a bit of a stuffy one, we didn't clear our lines at the corner and it had a few deflections. The pitch is pretty tricky here, it wasn't great for either side. But the reality is that a team that eight games ago had nowhere near this kind of endeavour, with the crowd not behind them like they were today, suddenly they have those things. When a new manager comes in, sometimes that is the way it goes." Crystal Palace manager Roy Hodgson tells BBC Sport: "The first half we were good value, certainly for 0-0 and we were confident we could keep going but the early goal in the second half puts you on the back foot. We played some reasonable football but it was difficult to get back after 2-0, the third goal killed us off. It was a sterling effort from the players and the way they went abut their business. We have to accept we were beaten. "We made our mistakes for the goals and were punished for them. The rest of the time we put a reasonable shot. We gave ourselves a mountain to climb after gong 2-0 down. "There is a certain frustration at the moment because we have not had thins going our way, especially with injuries. We have so many out, including important ones. The 11 who started the game gave a good account of themselves. "Defeats do eat into your confidence, just like wins boost your confidence. The players are aware what they are capable of and what they need to do. In these two weeks, I hope to recover a couple of players. Every game is a difficult one and we have to believe every game will be a scrap and a fight." "It is my work, it is what I must do, try to win games. When we arrived we changed things, changed the dynamic, some rules also. We take this risk and we create a new dynamic, they understand this, they are better and better with this, they follow the strategies, which is why I say all the time I am very happy with my players. "We were very deep in the ocean, down in water, so for the first time we put our nose out of water and we breathed a little last week. We start swimming now. Between now and the coast is still a long run, we must continue to swim a lot to be safe. Before we were in the deep of the ocean, we only saw fishes, stones and a lot of black things, but we can look to the coast now." Brighton manager Chris Hughton speaking to MOTD: "At this moment we feel like it's probably two points dropped, against a good Stoke side, who are in good form. I thought we had the better chances, but in a player like Xherdan Shaqiri, there's always that quality to get a goal." On the penalty decision: "I certainly felt it was not a penalty, but it was a great save by Mat Ryan. It was incredibly soft, you've got two players holding each other, if anything my player is pushing him away and the Stoke lad has gone down very easily. I think it's very, very harsh. "But saying that, both the save and the tackle were excellent, and we needed Mat Ryan again to make a save straight after from the corner. If you ever need a reason for players following up a penalty, Lewis Dunk has showed why with that tackle." On Jose Izquierdo: "It's not just about scoring goals it's his contribution throughout the game, and he's really settling in well now." Swansea boss Carlos Carvalhal, speaking to BBC Sport: "I am very happy with my players, very proud of them, they are doing fantastic work. They follow 100% the strategy we create, very professional. We blocked them, we started creating problems and as you know during the game I was not happy because we wanted to win, we felt we really wanted to win which is why as a manager I can start to risk and put more players in attack. "We put in Andre Ayew, Tammy Abraham, we had three attackers in the middle. We put all the meat in the barbecue, all the meat inside the grill, because we wish a lot to win the game. I am very happy because that created a big impact." West Ham goalscorer Marko Arnautovic, on his return from injury, to BBC MOTD: "I was hungry before I got the injury. My people helped me a lot to come back quickly. Nobody expected me to return that quickly. I try to give everything for the team. "Watford kept the ball a lot because they needed to score but they didn’t have a great chance you felt they had to score. Our counter-attacks and chances, we should have taken the game far away. "I keep working hard on myself. It was a tough beginning to my time at West Ham. I wanted to prove the critical people wrong. I’m surprised some people don’t like me as I have a good heart." Brighton goalkeeper Mat Ryan speaking after the match: "It looked like a pretty soft penalty - but I was fortunate to pick the right way and keep it out - and straight after that Lewis Dunk making that tackle and then Anthony Knockaert blocking on the line - it just shows how much character there is in this team. "It's vital to take points off teams around us in the league and we did that today, but we have to be more ruthless. We're on a decent run at the moment, with two home games next up, so hopefully we can get two home wins." On Jose Izquierdo: "His confidence seems to be growing and growing, that's only good for us and him." So that is 14 points from Carlos Carvalhal's seven Premier League games in charge of Swansea. A very decent turnaround - they are now up to 15th in the table, two points clear of the relegation zone. "He is a very funny and nice manager, everyone loves him and the way he has changed the team is fantastic. Everyone has improved a lot compared to when we were bottom of the league."